Prior to the introduction of cosmopolitan medicine, traditional medicine used to be the dominant medical system available to millions of people in Africa in both rural and urban communities. However, the arrival of the Europeans marked a significant turning point in the history of this age-long tradition and culture. 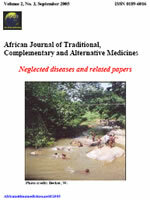 This paper examines the trends and challenges of traditional medicine in Africa. The impact of colonialism on African traditional medicine is also examined. Although the paper is on Africa, references are drawn around the world to buttress the growing demand for traditional medicine. The paper concludes that to minimise the current distrust between modern and traditional doctors and to achieve the objective of regulation, standardisation and cooperation, both traditional and modern doctors must acknowledge their areas of strengths and weaknesses from which they operate and be genuinely concerned about the difficult but necessary task of being human.